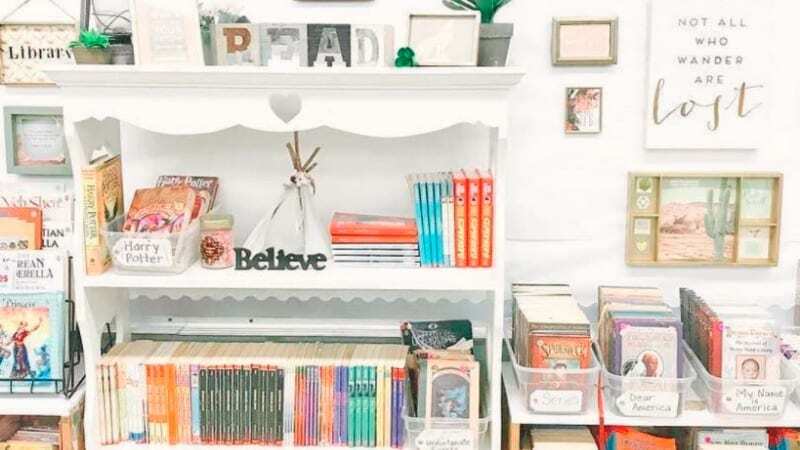 These teachers decorated their school rooms to feel cozy and inviting—just like home. We adore these #HomeSweetClassroom ideas, and you will too. Feel free to try out these classroom decoration ideas, or use them as inspiration. 1. This classroom reading nook is so cozy that we’re already looking for a good book. 2. Warning: brilliant group work is happening at this bright seating area. This *might* be my new favorite space in my classroom!!! I'm so excited for my littles to collaborate in this space! #flexibleseating @targetteachers check out these CUTE #targetdollarspot pillows! 3. Rugs, rocking chairs, and pillows with math problems … What’s not to love? 7. …Even if the fireplace isn’t real. #Repost @theflightofasparrow ・・・ The joy & pride of my classroom is my library… I hope that it fosters a deep love for books therefore allowing students to learn, imagine, explore, create, and take flight… to fulfill the destiny that God has so beautifully given us. 9. This would totally be my happy place. 10. Kids love a good reading teepee in the classroom. 11. You can also set up a full-size tent for that home-away-from-home feel. 12. Add plants and some wall hangings for a decorated classroom that feels like home. 13. This classroom spot is just made for rainy day reading. 14. A seat fit for a princess, or prince, doesn’t have to cost a fortune. 15. This is a seriously cute classroom decorated with an adorable welcome wreath. 16. No fireplace? No problem. This teacher put up photos and a deer mount above her mantel. 17. Nothing says home like a couch in the classroom. 18. In this classroom, everyone is family. 19. Maybe you want to put out the welcome mat for your students, literally. 20. We’re already excited to listen to a story at the feet of this fixed-up rocking chair. 21. This teacher nails the motivational sayings with her inspirational classroom wall art and pillows. 22. Personal touches like a plant, photos, and lighting make this decorated classroom feel like home. 23. We think it would be easy to “be awesome” in this cozy classroom. 24. We love this welcome wreath … and the classroom rules. 25. Speaking of adorable welcome wreaths. This one is quite functional, if you misplace your calculator. 27. Bring your own appliances to work day–especially those that make coffee. 28. Welcome kids to the classroom with this lovely homemade pumpkin sign. 29. Make use of the outdoor furniture year round by bringing it indoors to the classroom. 30. We’re not sure which we love more, the color-coded tubs or the cozy rug and matching pillows. This is my students' favorite place in our learning cottage. Who doesn't love a cute and cozy place to read?!? 31. Have a class campout with this creative campfire (that won’t violate any fire codes). Crystal Rennicke is a writer, Sunday School teacher and mom of two. Since most of her family members are teachers, she has an appreciation and admiration for all teachers in her life. Be the first to know about new giveaways, teacher tips, and laugh-out-loud posts. Sign-up to receive our newsletter.